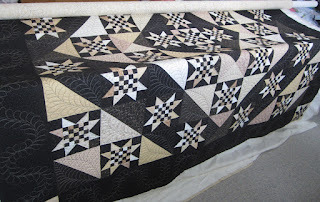 Last week I worked on this great quilt for my Bee Group friend Laurel. 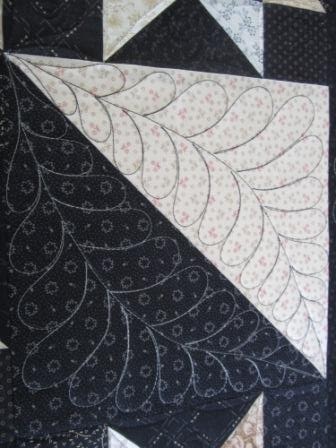 She wanted this king size quilt to be covered with feathers in the large triangles and the boarders. I knew what I wanted to do when she said feathers. It has turned out so well. Laurel was pretty excited to see it done, that she said she should find a quilt show to put the quilt in. 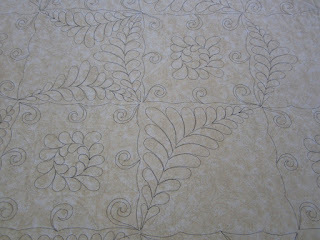 Here are some close ups of the quilting. I was daring enough to use black thread on cream fabric and cream thread on black fabric. It did mean I could see were I was quilting. Last week, we had some very hot days and evenings. The basement was the best place to hang out and I did quilt many nights. 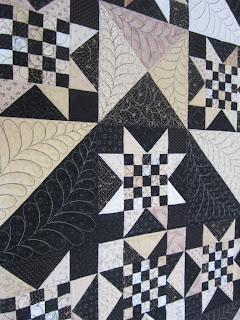 One night it was around 2:30am when I finally went to bed, I was quilting. I laughed because sometimes I have been asked when do I sleep. My answer should be between 2am and 9 am. Sorry these last two photos will not turn the other way. I do not have an editing program that fixes this trouble easily. Time to talk with my husband again about this. Here is the back of the quilt. You can see the star block better on the back as I did match the thread colour on the star. I have a second one of these quilts to do later this winter and she has seen what I did here and wants the same quilting. WOW!! 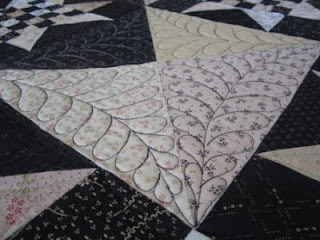 Great quilt and your feather quilting really makes it fabulous! Both the quilt and quilting ae gorgeous. That is just beautiful. You do feathers so well. One day when I grow up I want to do them like that too. 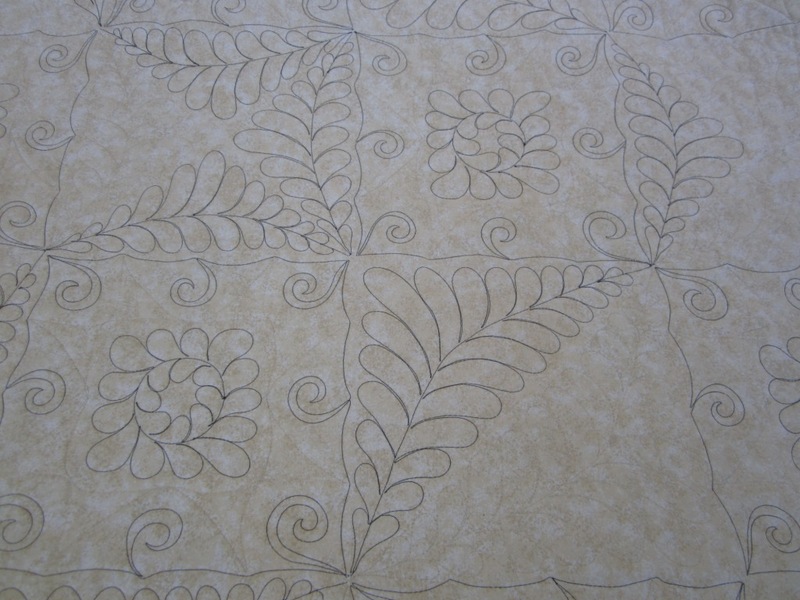 How long have you been long arm quilting. That quilt is stunning. Beautiful job! 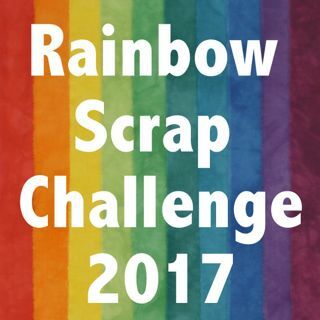 I'll bet it will win some ribbons. Lovely feathers and beautiful quilt. You two created a fabulous quilt together. I can see why she loved it. What a beautiful quilt and your feathers are awesome! Beautiful! 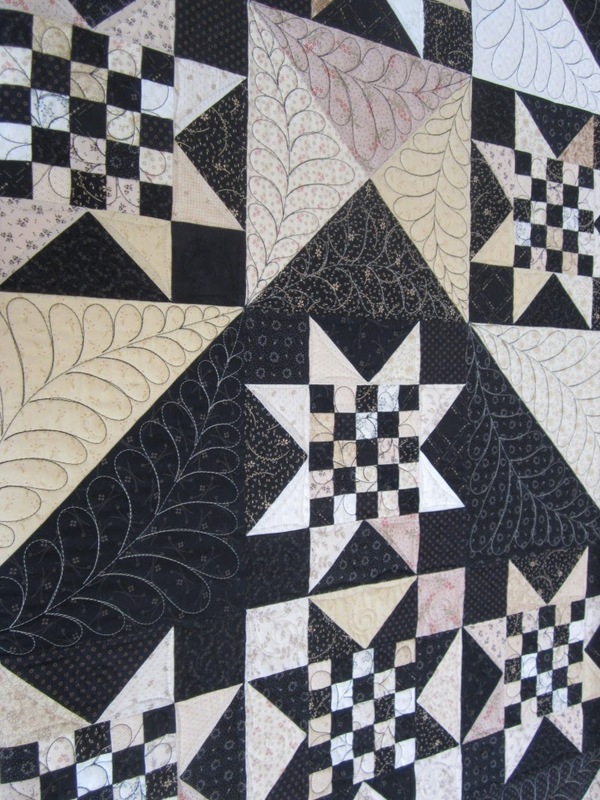 Your feather quilting is wonderful! Your black and cream thread colors are stunning!